Cerekloth‘s debut EP Pandemonium Prayers was part of a ten CD bundle on sale at Hell’s Headbangers back in ’08, standing out among the dregs even then despite its relatively unhewn state of development. The band has refined its craft in the years since, morphing from standard Scandinavian death metal fare into an outfit with a very real identity of its own. The dolorously titled In The Midst Of Life, We Are In Death hearkens back to an early 90s Euro-doom sensibility, in lyrical ambition and in texture; Cerekloth have developed a morose, distinctly necrotic slant to their music that is intimidating without being confrontational, ponderous but not self-absorbed. The rabid driving rhythms of the early days are largely shelved for a more contemplated pose, with dark melody taking precedence over unbridled speed, seeping the album in a quasi gothic-industrial vibe. At 38 minutes, this is a short record brimming with ideas and pregnant with possibility, and it is to the band’s credit that they are able to compact these into a well-reasoned musical space without disrupting its continuity. 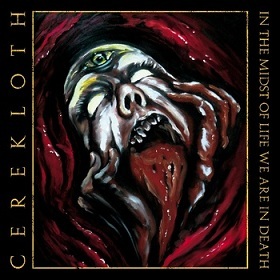 Rarely rising above a considered tempo, Cerekloth shift focus from conventional death metal riffing towards enhancing harmonic themes, basing songs around these musical worms and implanting them into a framework of power chords, drawn-out tremolo progressions in limbo, and galloping chugs. Not lacking a strong sense of groove on occasion, the band is adept at improvising within the constraints of their admittedly limited rhythmic palette, experimenting with subtle variations in phrasing and inflection to prevent proceedings from becoming one-dimensional. Post-metal trappings as practiced by the likes of Deathspell Omega in their more somber moments – desolate-sounding arpeggios, chiefly – add a little more doom to the bleaker passages; a jarring liability in the case of many modern metal bands that use such devices as filler but Cerekloth avoid coming off as a gimmick, absorbing these parts into an already consolidated aesthetic of dark energy, further embellishing the cinematic scope they strive for. A sludgy production job appropriately qualifies this recording for the muck but doesn’t detract from the obvious: there is elegantly understated musical effort invested here, a virtue overlooked in a style far too often concerned with more superficial considerations. Cerekloth take their place amongst a growing list of European bands, restless in spirit and intent on expanding the genre’s vocabulary. While not flawless, In The Midst Of Life, We Are In Death is still yet another step towards breathing new life into death metal. This entry was posted in Death Metal, Music Reviews and tagged Cerekloth, death metal, Denmark, In The Midst Of Life, Pandemonium Prayers, We Are In Death. Bookmark the permalink. Just started listening to it, and damn, I’m waiting for Layne Staley’s to start singng. Is it just me very drunk or would you too expect those two minutes from Alice In Chains? Hmm now that you mention it, Staley reference doesn’t sound too outlandish. It got me thinking off Paradise Lost’s Gothic when I first heard it.